Part four - what table tennis glue should you use? In parts one, two and three, I recommended that you buy a customised racket, rather than a ready-made racket, if you're serious about playing table tennis. 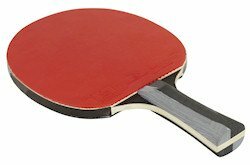 Well, if you've followed my recommendations and chosen your table tennis blade and rubbers to suit your style of play, you'll now need to know how to affix your rubbers onto your blade. Some suppliers will offer to do this for you, but they'll probably charge you for this. It's much easier to do it yourself. But did you know that there are only two ways that you can now affix your rubbers onto your blade? 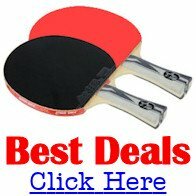 Since the 1980s, table tennis players have been experimenting with different types of table tennis glue to affix their rubbers to their blade. However, this type of glue contained compounds which gave off a distinctive odour and it was subsequently considered harmful to a players' health. So the International Table Tennis Federation (ITTF) amended the rules and effectively banned certain types of table tennis glue. With effect from May 2007, glues containing harmful volatile compounds (VOCs) were no longer approved by the ITTF. This included glues with organic and inorganic volatile compounds, excluding water. All previous ITTF approvals of table tennis glues were withdrawn and the ITTF no longer approves any type of glue. Water-based glues which are free of harmful volatile compounds are now the only types of glue which you can use to affix your rubbers to your blade. The ITTF also began testing rackets to check for unauthorised substances with effect from 1 September 2008, which was immediately after the conclusion of the 2008 Olympic Games. You can read all about these changes to the rules here. There are now only two methods that you're allowed to use to glue your rubbers onto your blade - using quick glue sheets or water-based table tennis glue. Quick glue sheets are 0.05mm thick transparent sheets which have two adhesive sides. They work in the same way that double-sided tape works, and they enable you to quickly and easily affix your rubbers to your blade, but they don't seem to be very popular with players. In my experience, they can be quite tricky to use, as it's very easy to get it stuck to itself and thereby make it unusable. The second method is to use water-based glue, of which there are two types - regular and speed. For most players, regular glue is all you need. You glue your rubbers onto your blade and then you only need to use the glue again when you replace your rubbers. Butterfly Free Chack glue which is completely free from organic solvents. After applying it to the blade and the rubber, then letting it dry, you can stick the rubber and the blade surfaces together. It's also very easy to remove the rubber from the blade and to peel off the remaining glue from the sponge when you want to change your rubbers. Speed glue is only suitable for an advanced player who uses an attacking / offensive style of play, but it requires frequent re-gluing to maximise its' effect. Butterfly Speed Optimizer One which meets the new ITTF standards for VOC free products. Although some table tennis suppliers will offer to glue the rubbers onto the blade for you, they'll probably charge you for this. I'd recommend getting an experienced player to glue them on for you, and show you how to do it properly at the same time. You don't want to waste your money by doing it yourself and making a mistake - but don't be afraid to learn how to do it yourself - it's easy after a bit of practice! As we saw in part three table tennis rubbers must incorporate the ITTF logo to show that they are authorised rubbers. Therefore, when you glue your rubbers onto your blade you'll need to make sure that the ITTF logo is clearly visible near the handle of your blade.